At Precise Smile, advanced implant and restorative dentistry is all we do. 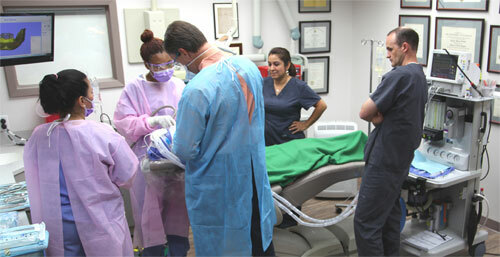 We focus on the care of patients with extensive and complex dental complications. In fact, most of our patients require full-mouth treatments. While this is a very niche market, our comprehensive approach allows us to provide a level of care that is unequaled in the dental implant marketplace. While many dental practices provide a wide array of dental and implant services, at Precise Smile we do one thing and we do it with excellence: comprehensive dental implant and restorative solutions that value the personal lifestyle and healthcare choices of every patient. We work hard to cultivate one-on-one relationships with our patients and understand both the functional and social importance of a healthy set of teeth. Our commitment to precision enables our patients to enjoy a long-term solution to their dental problems and a perfect smile that lasts a lifetime. Additionally, Precise Smile works through a network of highly skilled referring doctors. You can be assured that the dental health professionals providing treatment at Precise Smile have all the required training and are Board Certified in Prosthodontics, Periodontics and Oral Maxillofacial Surgery. To make our service extraordinary, we offer an on-site laboratory that enables us to provide imaging, laboratory service, surgery, and follow-up treatment to our patients from the comfort and convenience of our San Antonio office. For more information on Precise Smile’s founder, Dr. Stephen Schmitt D.D.S., M.S., and Diplomat of the American Board of Prosthodontics, click here.